A third-party auditor just showed up at your food processing facility. How confident are you in the performance of your magnetic separation equipment? Are the magnets at your critical control points still performing at full strength and how would you know? While magnets generally have a long and effective life, certain food products and processes can permanently damage them, resulting in loss of strength. If your operation has any of the three process-related risk factors for magnets, learn how to reduce your compliance and safety risks, as well as protect your equipment from damage. 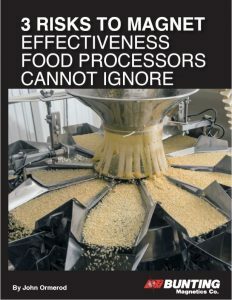 Dr. John Ormerod, Magnet Applications Senior Technical Advisor at Bunting Magnetics Co., explains how to improve magnet effectiveness for Food Processors and the benefits of magnetic pull test kits.